Today was Arbor Day for us! Not the official arbor day – that’s not until Friday here in Pennsylvania. But it is the day the Penn-Del Chapter of the International Society of Arboriculture held their annual day-of-service Arbor Day celebration. 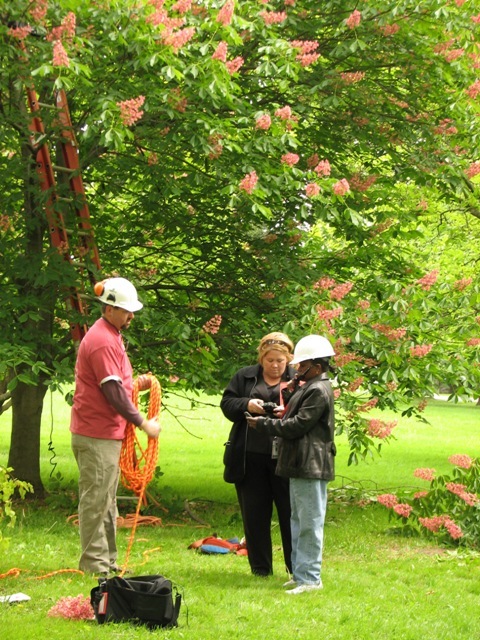 Each year several companies from our area get together and provide pro bono tree care at the grounds of a worthy non-profit organization that just is not able to budget for the tree maintenance work they really need. This year’s recipient was Friends Hospital in Northeast Philadelphia. A great time was had by all of us, many of whom compete against each other in the tree care business every other day of the year. But this day was different – there was great camaraderie among us as we teamed up and worked on some really special and sometimes historic trees for a good cause. 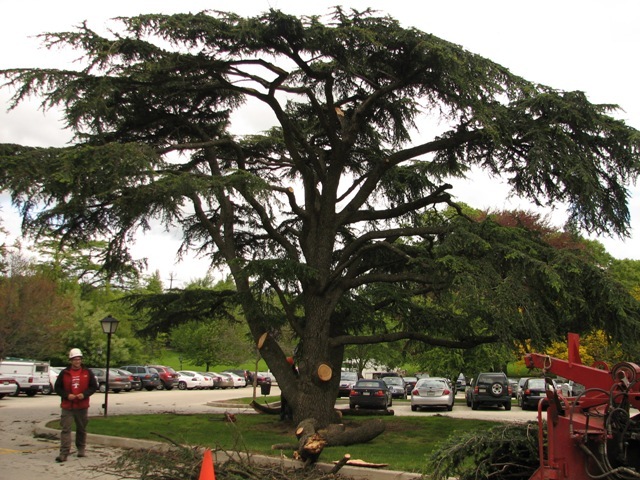 The Jacobs Tree Surgery crew pruned this cedar-of-Lebanon. It was in bad shape from snow-storm damage. Mike Chenail, our Penn-Del Arbor Day committee chairman, coils his climbing line after an aerial interview with KYW’s Karin Phillips. Here’s a link to the interview, if you click the audio part on the right you’ll hear all the background banter.